It’s not secret I adore all things autumn – crunchy leaves, cooler temps, hot apple cider, and pumpkin everything, to name a few – and the crowning jewel is Thanksgiving. Sometimes we skip past this one for Christmas and while yes, Santa Claus is coming to town and I am PUMPED, there is something so special about this season of thankfulness. I love that we have one holiday purely devoted to being grateful for the abundant blessings God has given us and not one gift is exchanged. Instead, it’s all about soaking up quality time with family and friends, eating yummy food and being grateful. So when I saw this post from TODAY and author Amy Latta I thought it was brilliant and knew we had to join in the fun. 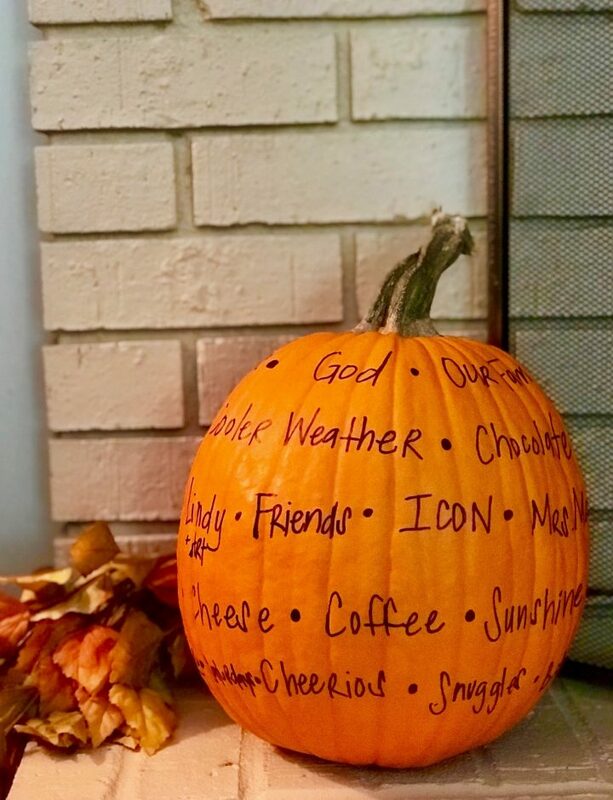 Using the pumpkin we had intended to carve for Halloween (thanks for nothing, rain), we got out a Sharpie and got busy listing all the things we’re thankful for – in no particular order. Annie joined in the fun by saying things/people she loved, and we used this as another opportunity to talk to her about saying thank you to God for all the ways He blesses us. I pray we keep this tradition going and can get the kiddos even more involved as they grow. Today, how are you focusing on the many reasons you have to be grateful? Is this a tradition you would start with your family? I’d love to hear.